Water damage is one of the top things that people claim for on their home insurance. If you don’t take measures to prevent it and catch any issues as quickly as possible, it can lead to very costly damage. There are lots of problems that could cause water to build up in your home, but you can prevent many of them by taking the correct precautions. If you want to avoid the disaster of water damage in your house, make sure you take these measures to minimize the likelihood of anything happening. You need to watch out for leaks, clean your gutters, and do a number of other things. If you want to stop small problems becoming larger ones, you need to be vigilant when it comes to leaks in your plumbing and home appliances. While it’s difficult to detect some problems, such as leaking pipes within the wall, you can spot others earlier. If you notice a leak coming from a pipe, faucet, washing machine or somewhere else, get it fixed as soon as possible. If you can already see a buildup of water, make use of a company that provides water damage services as soon as you can to stop it escalating further. Natural disasters, such as storms and flooding, can cause water damage in many people’s homes. If you live in an area prone to such weather conditions or you have received a warning of them, make sure to prepare your home. You can use sandbags if water levels are going to rise, install a pump in your basement to get rid of excess water and seal your basement windows well. As well as stopping the water coming in, you can do things to minimize damage, such as raising your electrical sockets to above the expected water level. Some people’s homes fall victim to water damage when they leave them unattended. When you go away, be sure to close all doors, windows, and skylights to prevent water getting in. If it’s cold, leaving the thermostat at a lower temperature will help to prevent frozen pipes. When leaving your home for extended periods, you might also shut off the gas to the water heater (some might have a special vacation setting). It’s also a good idea to turn off the supply line for your water softener. 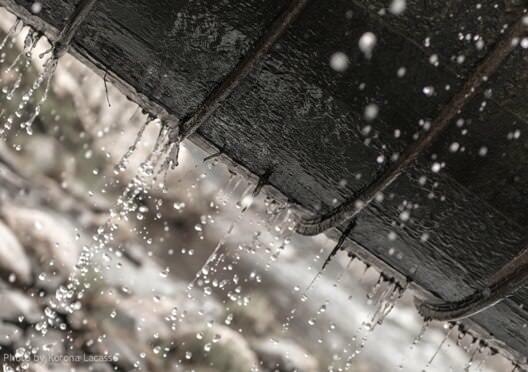 Your gutters are essential for directing rainwater away from your home, to stop it pooling in unwanted places. But they only work if they’re in good condition and you keep them clear. It’s a good idea to check your gutters regularly to clean them of leaves and other debris. You should also check for cracks or other damage that could prevent them draining properly. Your downspouts should direct water a good distance away from the home, with your yard sloping away from the foundation. There are other things you can do to protect your home from water damage, but these tips are a good place to start. If you’re not sure how well your home is protected, carry out an inspection to look for vulnerable areas.